Julie Miller Investment Art International Institute is an art gallery based in the Mall of Africa. The gallery aims to advance global investment in the African art industry for the benefit of its investors and artists. ART AFRICA spoke to Julie Miller about its unorthodox location, inception, and vision. Gallery view of Julie Miller Investment Art International. Courtesy of Julie Miller. 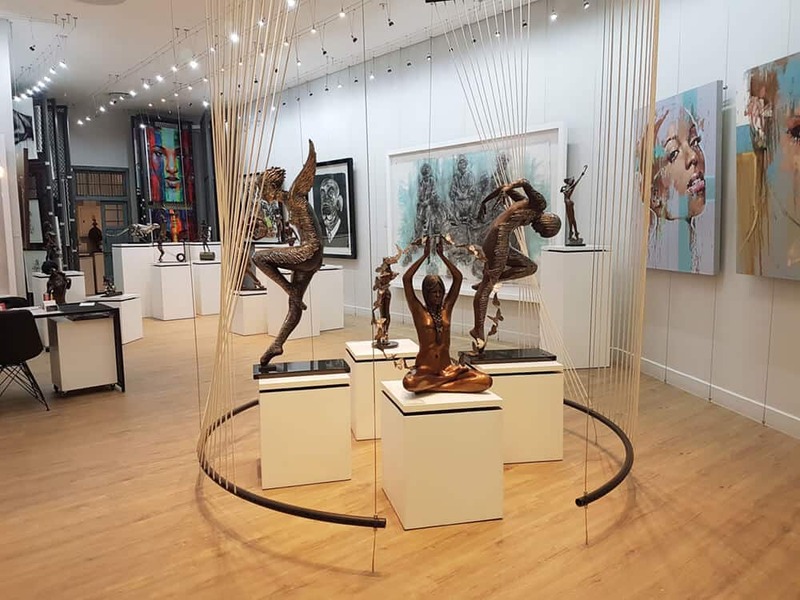 ART AFRICA: Please tell us about Julie Miller Investment Art International Institute from its inception, vision and how it came to be based in The Mall of Africa. Julie Miller: My investment roots run deep. I am a trained investment analyst and CFA charterholder. I have an MBA specialising in finance and I served as a trustee on the Group Provident Fund Board of Trustees within a major financial institution. However, I have always had a passion for contemporary art and Julie Miller Investment Art International Institute was launched on 10 July 2016. After collecting for some years, I came to realize what a great investment the right kind of art can be. So, I decided to combine my two major interests and start a business focusing on art as an alternative investment asset class. Being new to the industry, I had no existing client base, so I chose to open an art gallery in the Mall of Africa, where I could benefit from the exposure to high-LSM customers. Our vision is to advance the global investment potential of the African art industry, for the benefit of both our artists and our investors. We want to uncover and develop new artistic talent and give them the opportunity to be exposed to the world. In this way we expect the visual art sector to generate a real and useful contribution to the economic development of our inherently creative continent. You have spoken about how you attempt to demystify art for the public. How has the institution actively engaged with the public to ensure this happens? We have partnered with the Mall of Africa to create the largest series of public art exhibitions in Africa, by turning the entire upper level of the mall into an art gallery for 3 weeks at a time. These exhibitions take place twice a year, each displaying more than 500 artworks by 120 artists. One of the key objectives is to bring art to life in a publicly accessible retail space, allowing for an entirely new audience to be exposed to contemporary art from our continent. At the same time, it creates a professionally-run, broad-based platform for artists to showcase their work – and for new, young and emerging artists to exhibit their work alongside established artists. We are aware that you also work with art students from the University of Johannesburg. How are your artists selected? For the public art exhibitions, we work with students and artists of all ages, to expose the public to as broad a range of visual arts as possible – including digital, installation and performance art. For these exhibitions, we try to be as inclusive as possible. We do, however, have strict criteria to select artists for representation in the gallery. Our criteria favour artists who understand the importance of growing their personal brands through sound business practices. Brand management plays a key role in creating a strong potential for growth. What sort of opportunity and exposure does the Institution provide? Apart from the public exhibitions at the Mall of Africa, we aim to host ten exhibitions a year in the gallery. As a location, the Mall of Africa provides unparalleled exposure. It has easy accessibility from both Johannesburg and Pretoria and, along with the significant number of high-LSM residents moving into the new up-market developments in and around the mall, we also enjoy large numbers of foreign tourists who are always keen to take home a work of art by an African artist. In addition to exhibitions, we participate in local and international art fairs and are actively developing our partner network to create opportunities for artists in other countries. Technology is also a key focus for us. We leverage our website, social media and other tools to cultivate local and international exposure, and to eliminate as far as possible, the barriers to location independent art investment decisions. It’s very tough to judge from an image on the website whether an artwork is small or large. We need to enable people viewing the artworks on our website to be able to make art investment decisions regardless of their location/distance from the gallery. We need to find a way to let them really see art on the wall and get a sense of it. For this, we are using virtual reality imaging and software. What are your concerns or hopes for the future of African contemporary art? The international community is becoming more aware of the breadth and depth of creative genius on the African continent. I would like to see that result in a measurable increase in value for those who invest in our artists and our culture.